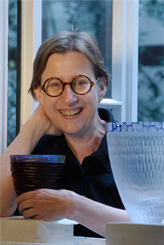 Gabriele Kustner is a much sought-after international glass artist from Germany. She was born in 1958 and has spent a good part of her adult life creating incredible glass. She attended Pilchuck Glass School in Stanwood, Washingtonin 1985 and 2002. From 1981-1984 and from 1984-1985 she assisted David Huchthausen at the Appalachian School of Crafts in Smithville, Tennessee. She also attended the State Polytechnics of Glass in Hadamar, Germany. Additionally, Kustner was a teaching assistant at Pilchuck from 1991-1992. The International glass artist has received numerous awards over her career including, but not limited to, the State Award of Bavaria in Crafts (Munich, Germany), the Glass 2000 2nd Award from the Glasmuseum (Immenhausen, Germany), the Award of the Federal Glazier Council (Hadamar, Germany), the State Award of Lower Saxony for Excellence in Crafts (Hanover, Germany) and the Johann Michael Maucher Award (Schwaebisch-Gmeund, Germany). Gabriele Kustner has been included in exhibitions internationally in France, Germany, Italy, the Netherlands, the United States, Sweden, Switzerland, Columbia, Poland and Japan.